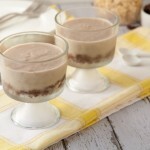 8 ingredient gluten-free and vegan chocolate banana ice cream cups with no added sugar. Pulse raisins until smooth. Add remaining base ingredients and pulse until combined. Mixture should stick together when pressed. Divide mixture into 4 dessert-style cups. Press with fingers and set aside. Place bananas, coconut milk, vanilla bean and a pinch of salt in your blender and blend until smooth. Distribute banana mix into each cup, on top of the chocolate base. Place the cups in the freezer for 3-4 hours to chill. If you’re sensitive to oats, replace with toasted quinoa flakes (toast in 350F oven for 5 minutes, cool and add to recipe). 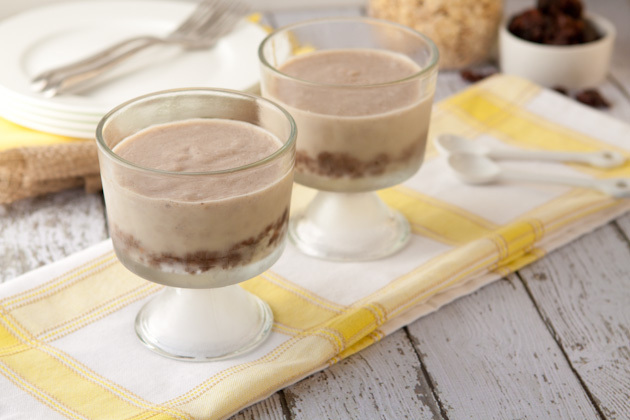 If you want to make the dessert grain-free, replace oats with unsweetened shredded coconut. Feel free to store these cups in the freezer for up to a week. Just make sure there is a lid on them so that they don’t get freezer burn. Allow to sit out on the counter for a couple of minutes before enjoying.